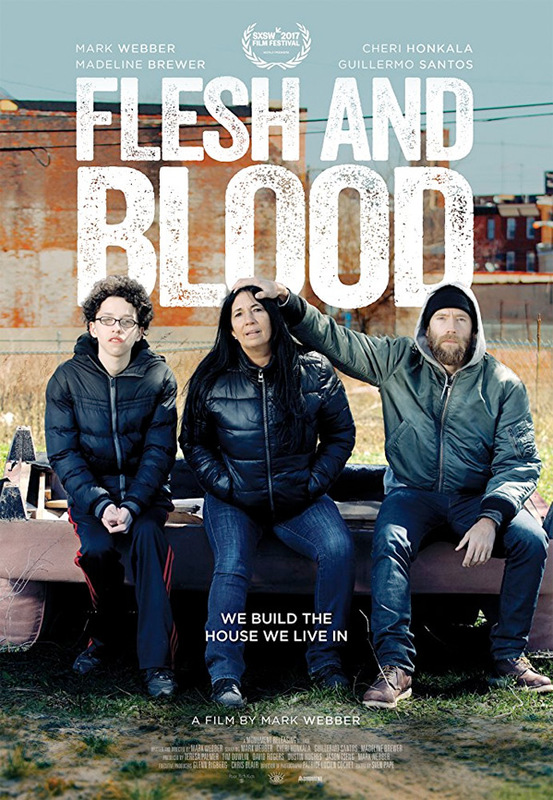 "You know how hard it is for him to try to find work out here with his record now…" Monument Releasing has unveiled a trailer for the new film both written and directed by acclaimed indie actor/filmmaker Mark Webber, titled Flesh and Blood. Webber tells a very personal story, blurring the line between narrative and documentary, involving his own actual, real-life family. The title of the film is a reference to his decision to confront a person from his past, raising the question: "Will Mark's life remain defined by his own flesh and blood?" In addition to Webber, the cast includes Guillermo Santos, Mark's younger brother who struggles with Asperger's Syndrome in real life, Big G played by Guillermo's actual father, and Cheri played by Cheri Honkala, Mark's real-life mother, anti-poverty activist, and the Green Party's nominee for vice-president in the 2012 US presidential election. Her activism and her choices in men are a constant source of conflict in her relationships with her children. This looks fascinating, emotional, and completely authentic. Based on real life events & captured in a hyperrealistic style, Flesh and Blood unapologetically straddles the line between narrative & documentary to lay bare the beautifully flawed nature of life. Reality belies fiction & vice versa as the characters in the film are played by their real-life counterparts. The central character, Mark, is played by director/actor Mark Webber & draws from elements of Mark's actual life. The film leads up to a pivotal scene wherein Mark the character & consequently the real-life Mark confronts a central figure from his past in hopes of finding the answers to a childhood mired in pain & an adulthood beset with addiction. In the end there is only one question: Will Mark's life remain defined by his own Flesh and Blood? Flesh and Blood is both written and directed by actor/filmmaker Mark Webber, director of the films Explicit Ills, The End of Love, and The Ever After previously. This first premiered at the SXSW Film Festival earlier this year. Monument will open Flesh and Blood in select theaters later this fall.